I find it fascinating that a mere nine months ago, I had never tried a pupusa (never even heard of it in fact.) To date, I think we have been to no less than four places that offer them. Now, they come to south Minneapolis and in a great way. I found La Plamera utterly charming. It could have been Kinkerlin (Kin for short), half of the husband/wife team who owns La Palmera, who was serving us and was so kind and friendly. Her enthusiasm was hard not to appreciate. It might have been the youthful and clean feeling with its warmly colored walls and pop music that these young, new entrepeneurs bring to the establishment. It also could have just been me, having owned a restaurant before, wanting to see them succeed in a tough, often thankless business. Whatever it was, I was glad to be there. At first glance, the menu is quite simple, a wise approach for someone still finding their feet. It is an interesting mix based on the nationalities of the two owners, Maurice who is from El Salvador and Kin who is Guatamalan. Breakfast is served all day and consists of eggs, simple meats, fried plantain and homemade tortillas. The rest of the menu consists of some really tasty Salvadorian appetizers such as fried or boiled yucca, pastelitos de carne (meat pies), tamales and chicharron. Then you have the typical four pupusas: loroco, cheese, beans and cheese and rebueltas (chicharron and beans) with cheese. The rest of the menu consists of grilled steak, chicken cooked in a variety of ways, pescado (fried tilapia) and soup on the weekends. The menu is rounded off by three cheap, simple and delicious desserts. As per our agreement laid out in our intro article, we always order tacos and tamales and since they have no tacos, we were glad to substitute some pupusas. 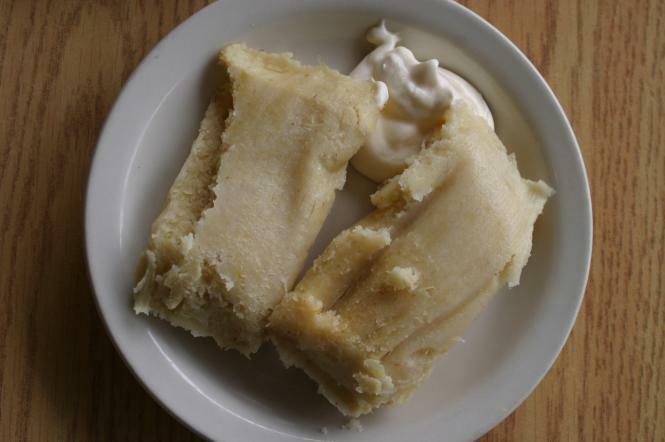 We ordered the tamales de elote, the yucca frita and then asked Kin for her recommendations. 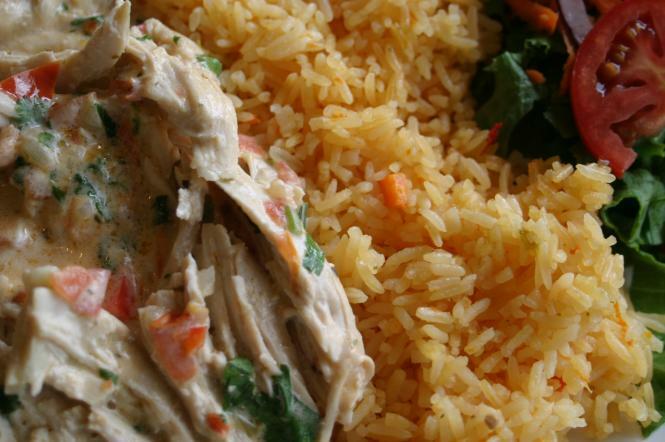 Without a second thought, she told us we should try the Pollo crema, or creamed chicken. I quickly understood that not much here, if anything, is premade. All of the tortillas and pupusas are made to order and so the food takes a bit of time. However, they had everything out to us in under 20 minutes. Tamales de eloteRight away, we took in our first tamales de elote. We had heard rumors, but until you see and taste one, they are a bit hard to explain. We immediately dug in and to our surprise, thought we were having dessert. They are pale white, made from fresh sweet corn and taste like summer. With the side of sour cream, these are certainly a treat: sweet, creamy, slightly savory and just delicious. We have nothing to compare these with, but I certainly will order them again. Next up was the appetizer, the yucca frita con chicharron. 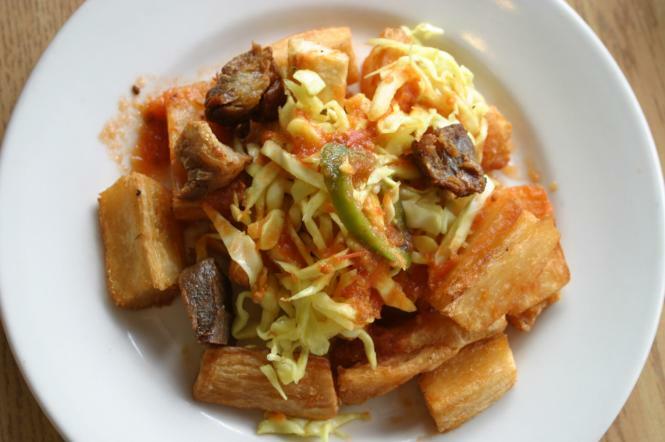 The presentation on this dish was supreme, being a mix of crispy fried sticks of yucca, soft yellow cabbage, thick and chewy cubes of chicharron and it Yucca frita!was all brought together with a nice, fresh tomato sauce. If the textures sound good, the tastes are even better. This might just be the best yucca we have eaten, ever. It was crispy, savory, creamy and the chicharron was unique in the fact that it wasn't your typical "cracklins" that are greasy and crunchy. This was their own take, a solid cube of meat that was dense in flavor and was more like jerky or cured meat. I found that I actually preferred this to the cracklins. The curtido, or cabbage slaw, was nice and simple, with just a hint of oregano. Well done! The pupusas were the one thing we were confident about. We ordered our favorites, con loroco and con rebueltas. First off, they were less greasy than some, both inside and out, which made them a bit lighter. I could have eaten half a dozen. The attention to detail was also excellent. 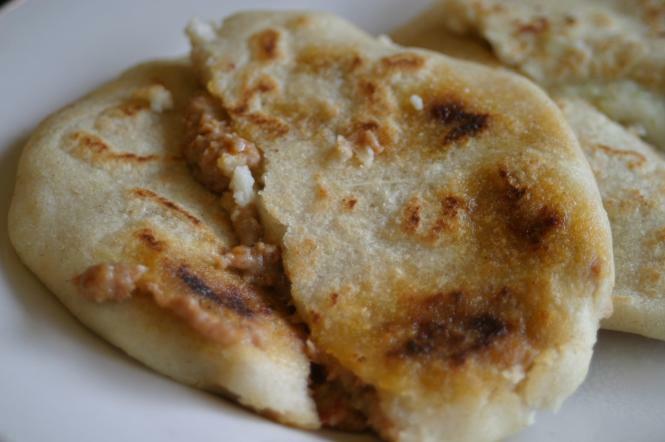 Instead of just a few piece of loroco, it was minced up and prevalent throughout the whole pupusa. This led to a superb flavor. As for the rebueltas, they were also very good. Some we have had were much too greasy and without flavor, but this mix of chicharron and beans was well done. The meat and beans were incorporated together and led to a more cohesive flavor. As with the yucca, the curtido served along side was a nice mix. I always appreciate a vegetable with my protein. Finally, we came to the much anticipated Pollo crema. We learned that this dish was a specialty of Kin's mother and was often served on special occasions. Now, they are sharing it with us. 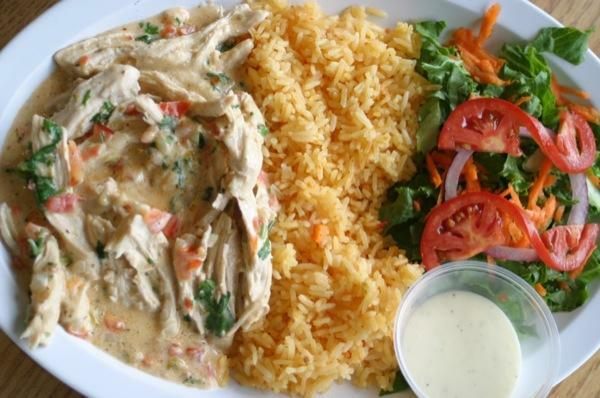 It would have been just a simple and delicious creamed chicken, but it was made even better by the addition of fresh tomatoes and cilantro. It brought this dish to life and made it fresh! Then, you add a very well seasoned side of rice and a salad made with real, green lettuce and this was a fine dish. It is the type of meal that anyone, from child to grandparent would love. Ok, so perhaps we are easily impressed, or perhaps the folks at La Palmera are just doing a really nice job. Either way, we will certainly be back. As a matter of fact, just two days after our initial visit, I found myself in the neighborhood and wanting breakfast, so I dropped in to have some eggs and coffee. The place was presently quiet and inviting. They even had wi-fi. I ordered the huevos con salchicha (sausage), which was served with refried black beans, sour cream, fresh tortillas and a wedge of fresh cheese. For $5 this was a great deal, but don't be surprised that salchicha in most cases means hot dogs. Yup, you heard right. If this freaks you out, order it without meat or try the ham. I was really wishing that I had someone else with me so that I could order the plantains. I suppose it gives me something to look forward to. The meal was simple, the tortillas and beans were amazing and if you remember to order some salsa picante on the side, this is a can't miss breakfast. To sum up, would we go back? Obviously, yes. But what for. Really, I want to try everything on the menu. We were told to try the chicken tamales next time and I know I won't be able to go back a third time without getting those darn plantains. I think I will also try the fried tilapia. No matter what I get, as long as it has some of those tortillas on the side, I can't go wrong. Just be aware that they are still starting up and you might have to ask for a coffee refil or remind them to grab the hot salsa. Don't let these little things ruin the amazing food and good spirit of Pupuseria La Palmera. Surprise: Fresh Tortillas!! We were also surprised at the "youthfulness" of the place. Finally, the prices were super reasonable...cheap even. Language: not a problem. Easy to communicate, easy menu to read. Lawrence Black is a writer and editor at Simple, Good and Tasty. He can be reached at lawrence@simplegoodandtasty.com. 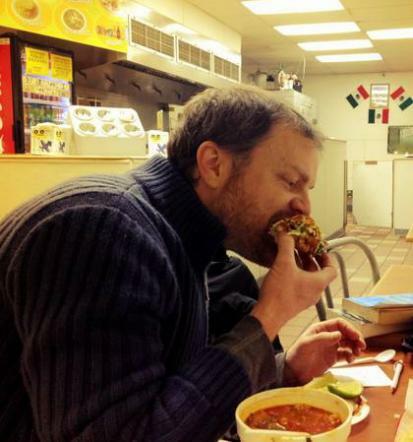 Despite the heat of summer, he continues to eat large quantities of spicy things...and without beer (a true daredevil). Our last Latin Tongue review was: Andale.